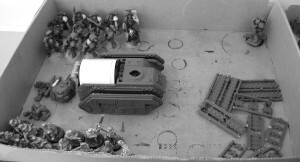 I’ve been updating some of my Deathwatch space marines so that they’re a bit more consistent – sternguard and veterans get nicer shoulder pads (the metal ones from Games Workshop), sternguard with their special issue ammo get the deathwatch boltguns with ammo selectors (also from that kit), normal marines get standard boltguns and plainer Inquisition shoulder pads, and veterans get forgeworld boltguns. Thus, I’ve changed out Kantor’s bolter for a forgeworld one. 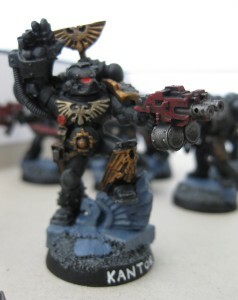 Similarly, I’ve swapped out the Librarian’s bolt pistol for one from forgeworld as well. 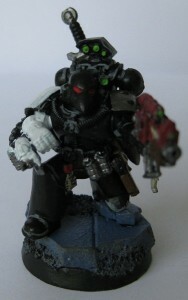 Along with this, I’ve redone the apothecary I did ages ago for a Deathwatch RPG campaign, so that now his gun is magnetised and swappable for a bolt pistol (since apothecaries don’t get special ammo in 40k, if I ever actually use an apothecary in a command squad that is), and given him a nicer shoulder pad. 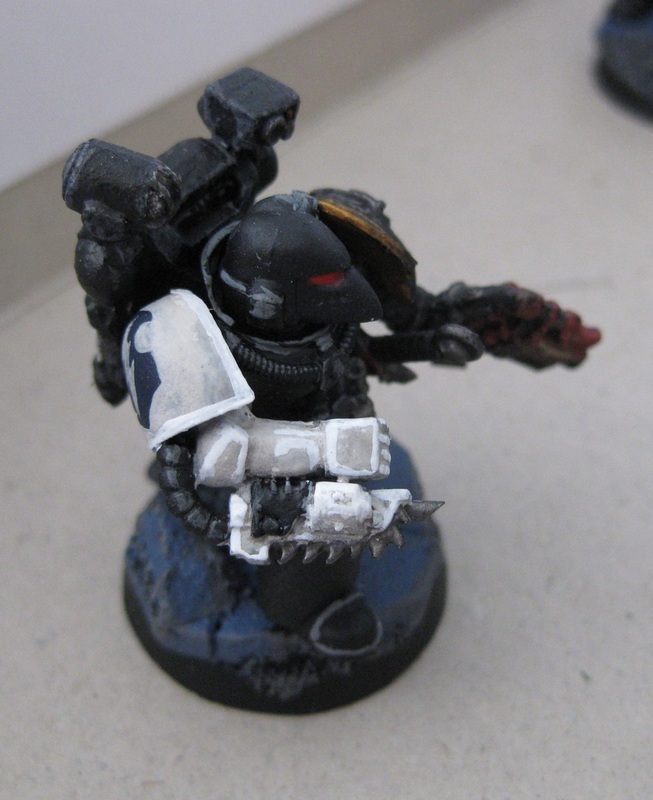 I also edge-highlighted his reductor arm in white, to make it pop a bit more (as it looked a bit too grey before). 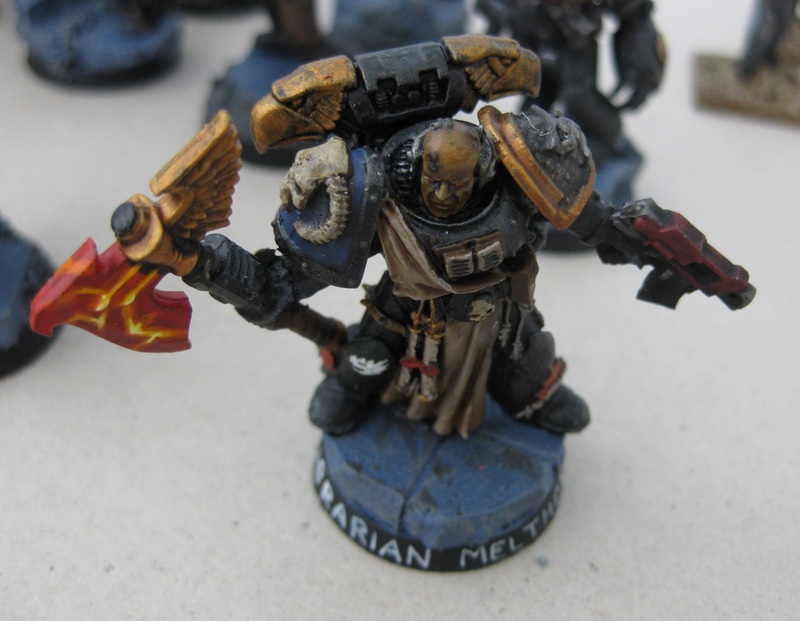 Quick mid-week post – I’ve been trying some more advanced stuff recently, and one of the things which caught my eye is the lightning-style power weapon effects. 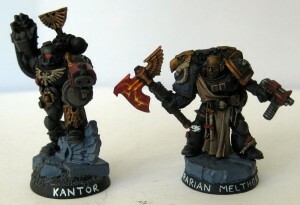 One of my friends at my local club has done it with great results, so I figured I’d give it a go as well. I’m a fan of simple, clean schemes, so I didn’t want to do lightning power weapons everywhere, but the force weapons on the two librarians I own seemed like a good place. 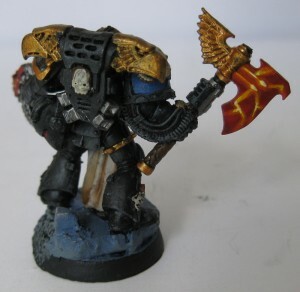 The Deathwatch librarian above has a magma-style lightning axe, as befitting his Salamanders origin chapter. I didn’t do much mixing of paints here – instead, I did thined layers and tried (with some success) to wet-blend from red through oranges and yellows to the white spots. Once everything had dried, I glazed it with the new GW yellow glaze to soften the edges where my blending was less than successful. 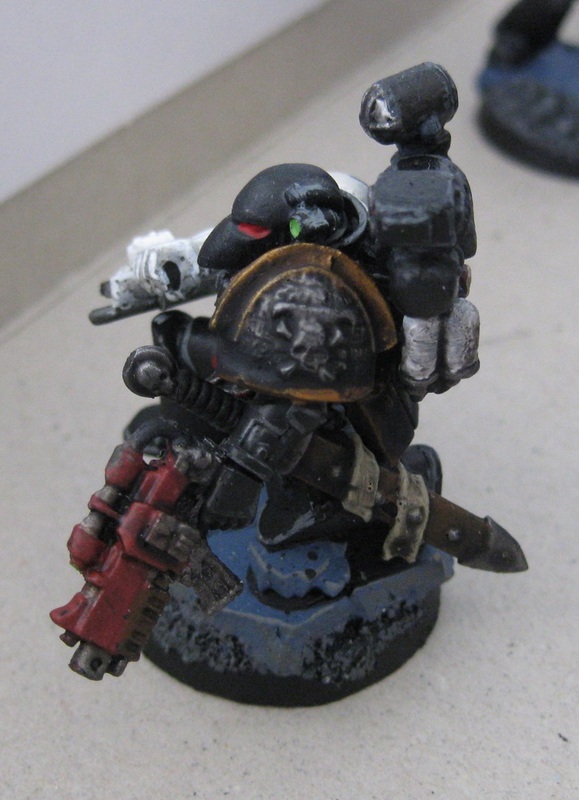 The rest of him isn’t done – I’m redoing all the deathwatch marines with the new washes to give them a little more detail, so right now most of him still is rather flat. Emboldened by the previous success, I went ahead and did the terminator librarian’s converted axe as well. 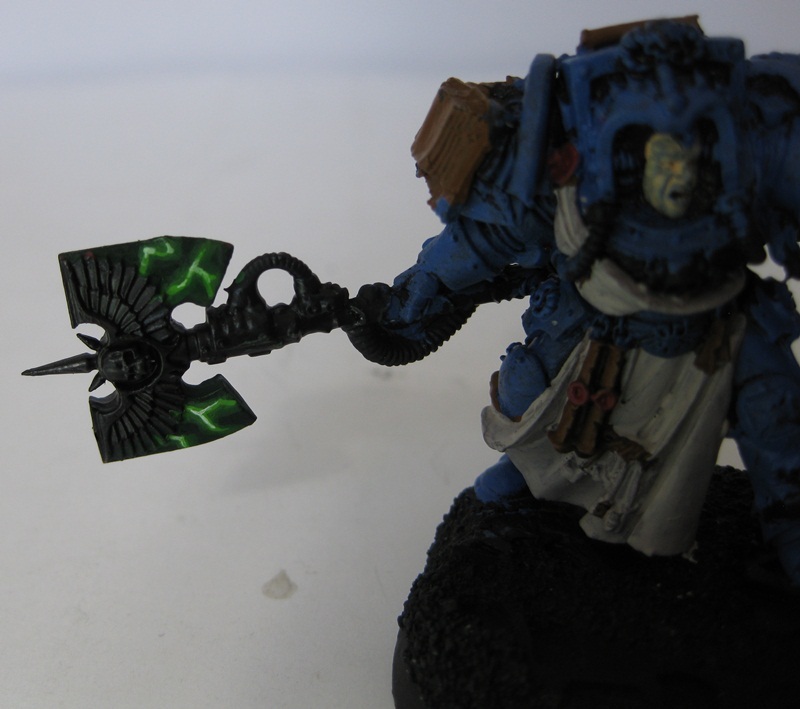 The rest of him is still in progress, but I’m pleased with how the green lightning effect came out on the rather small areas of the big axe (that eagle takes up a lot of space!). 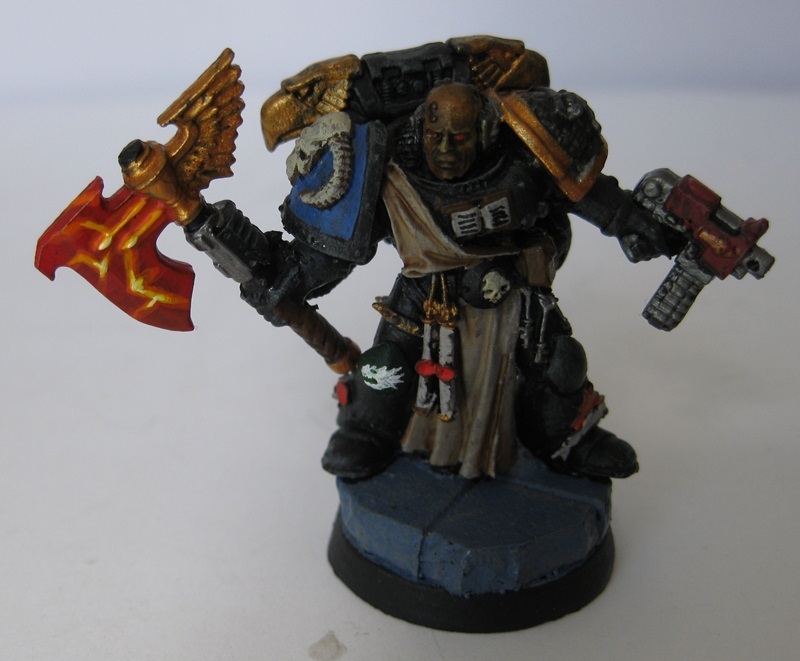 One problem with slowly painting better – or with more detail – than I used to: the new models make my old models look bad. Hrm.